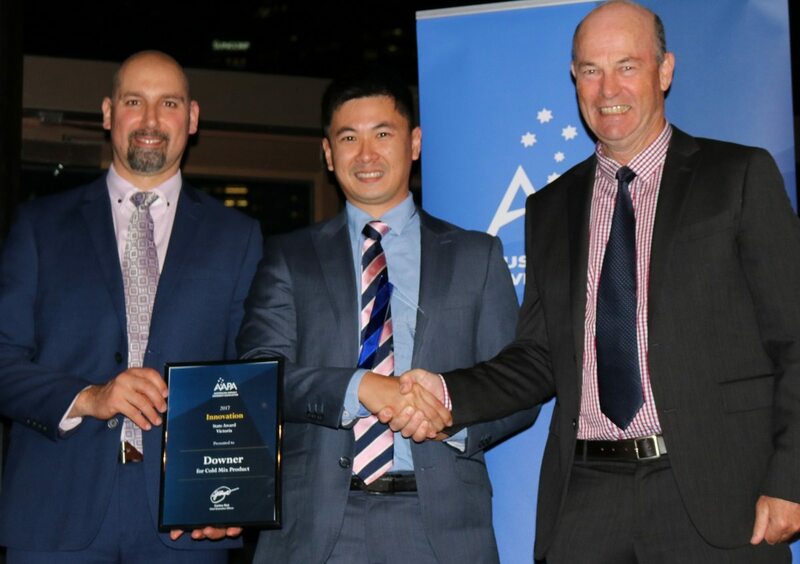 Congratulations to the 2017 AAPA Victorian State Industry Award Winners. Congratulations to the 2017 Victorian Safety Initiatives Award winner Chris Guymer from Fulton Hogan. His colleague David Snape accepted the award on his behalf. They worked with their organisation’s management and manufacturers to develop and test a system that detects objects or people behind reversing plant and automatically apply the plant’s brakes. Carlos Rial AAPA, David Snape FULTON HOGAN, Sebastian Oliva FULTON HOGAN and Victorian Branch Chair. Congratulations to the 2017 Victorian Emerging Leader Award winner Jeremy Hochman from Downer. Callum Bollard accepted the Award on his behalf. Sebastian Oliva FULTON HOGAN and Victorian Branch Chair, Callum Bollard DOWNER, Jeff Doyle ALTUS TRAFFIC MANAGEMENT. 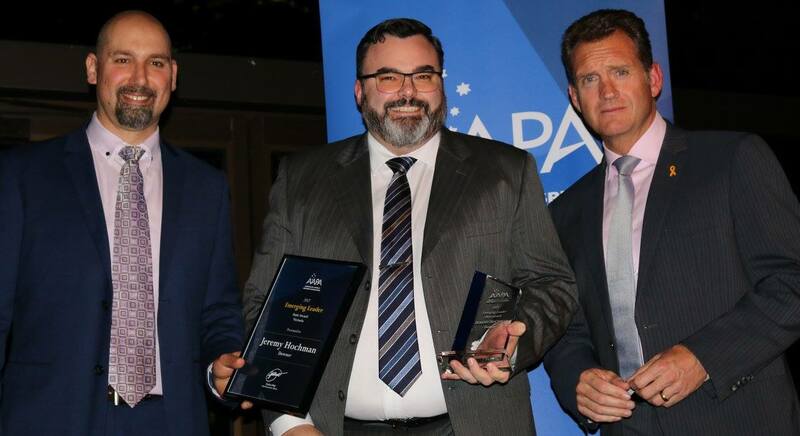 Unable to attend the event, Jeremy received his award in the Downer office. Mark Taylor DOWNER, Jeremy Hochman DOWNER, Dante Cremasco DOWNER and AAPA Board Member. 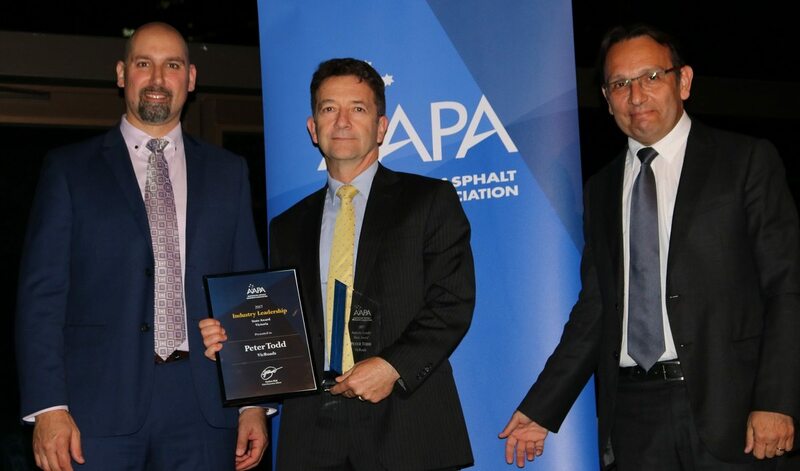 Congratulations to the Victorian Boral Asphalt Team for the Outstanding Project Award for the Tullamarine Freeway Widening Project (overlay works). 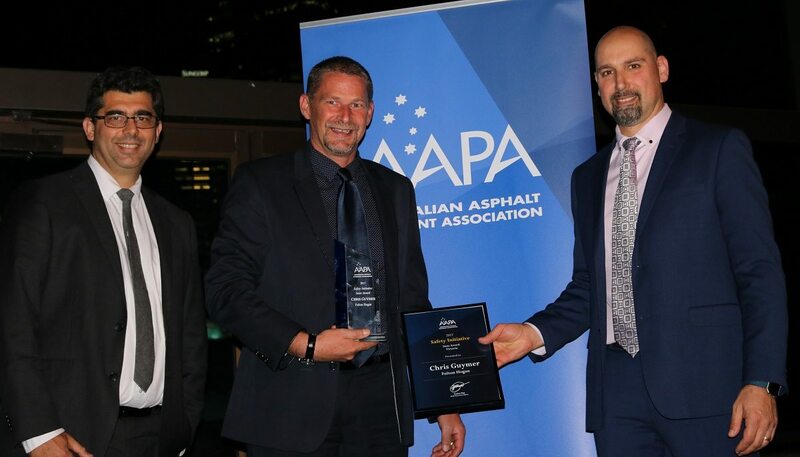 Tim Oudenryn accepted the Award on behalf of the Boral Team. Sebastian Oliva FULTON HOGAN and Victorian Branch Chair, Tim Oudenryn BORAL,Trevor Distin SAMI/COLAS. 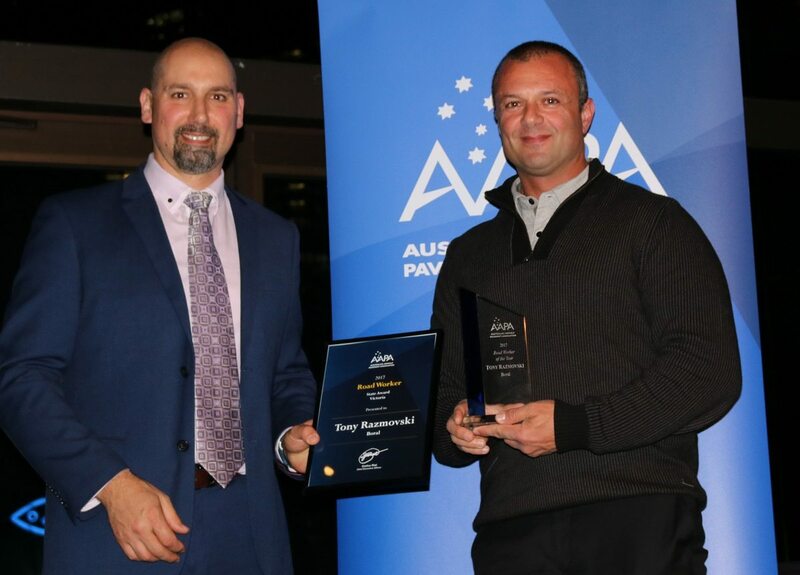 Congratulations to the 2017 Victorian Road Worker of the Year Tony Razmovski from Boral. 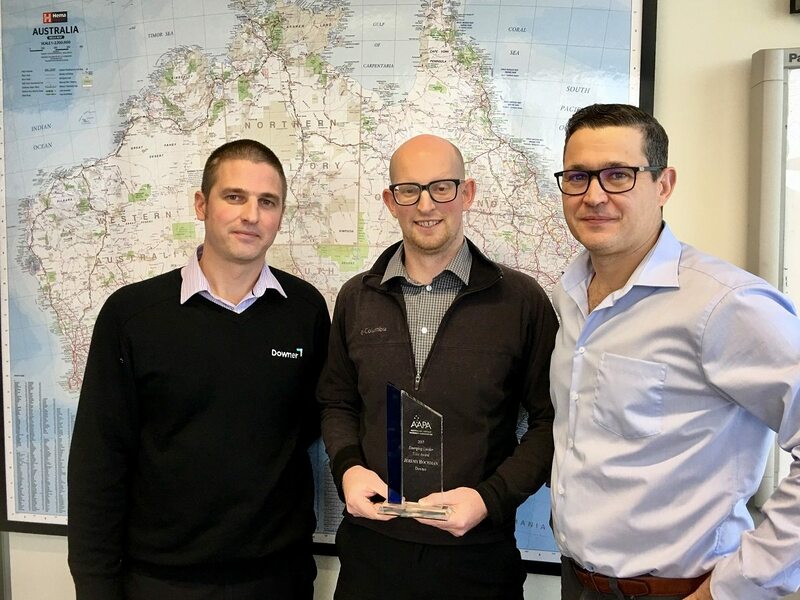 Congratulations to the Victorian Downer Group Team on taking out the Victorian Innovation in Design, Process or Product Award for the Cold Mix Product. Jerry Tan accepted the Award on behalf of Downer. Sebastian Oliva FULTON HOGAN and Victorian Branch Chairman, Jerry Tan Downer, Trevor Distin SAMI/COLAS. 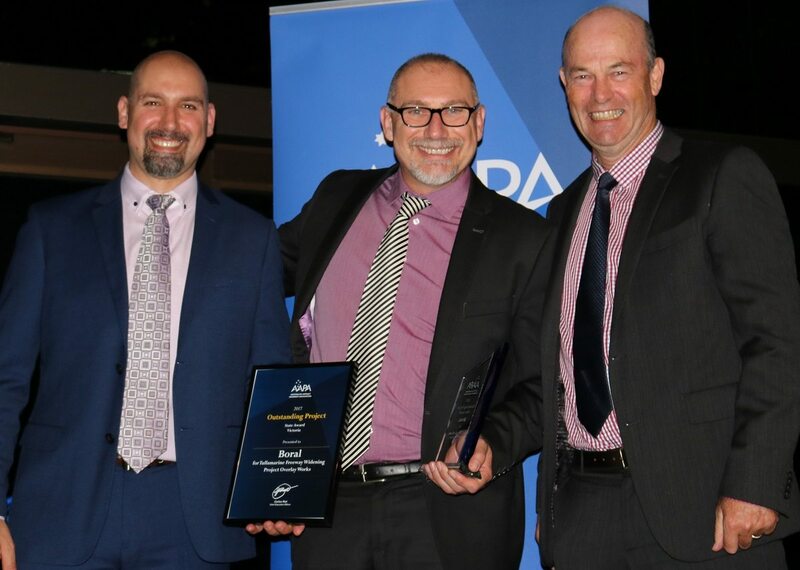 Congratulations to Peter Todd from VICROADS and previous AAPA Board Member for taking out the 2017 Victorian Industry Leadership Award! Sebastian Oliva FULTON HOGAN and Victorian Branch Chair, Peter Todd VICROADS, Jorge Boil ASTEC AUSTRALIA.